I’ve really gone of the sewing deep end, because I am about to post a picture of my underwear on the internet. Yes, you will be spared pictures of me modeling said underwear, because some things can be taken too far. I love the undergarment sewing trend that has taken the world by storm. I cannot wait to join the ranks of those who make every stitch of clothing that they wear, but I know these next few months should be… interesting… size and shape-wise. So I thought it would be fun to dip toes in the lingerie-sewing waters with something a bit more practical. These three nursing sleep bras are based on one I bought from a Big Name Maternity Wear Store. I like this style during that first very wet week or so of nursing, and for night-time wear. However, I loathe shopping at that maternity store. LOATHE!!!!!!!!! I don’t know what I dislike the most their ridiculously un-inclusive size ranges, or their pushy sales people that insist on entering your due date and personal information into their computer (information which they turn around and sell to other companies), or the high-way robbery prices for shoddily-made garments, or their stingy return policy? sigh. Can you tell how much I hate them? ugh. I do. Anywho. 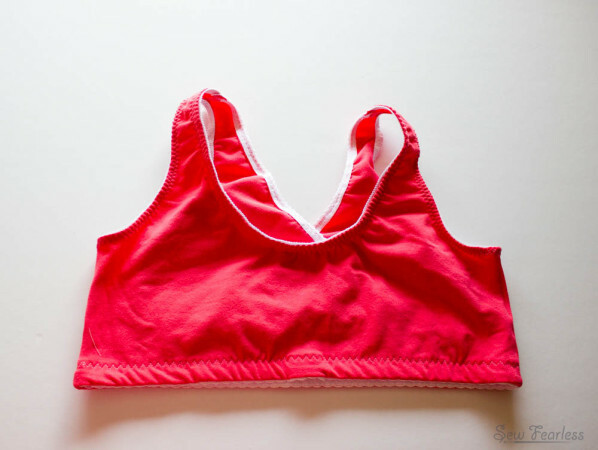 When I looked at my original sleep bras, I realized just how doable they would be to replicate and so I did! 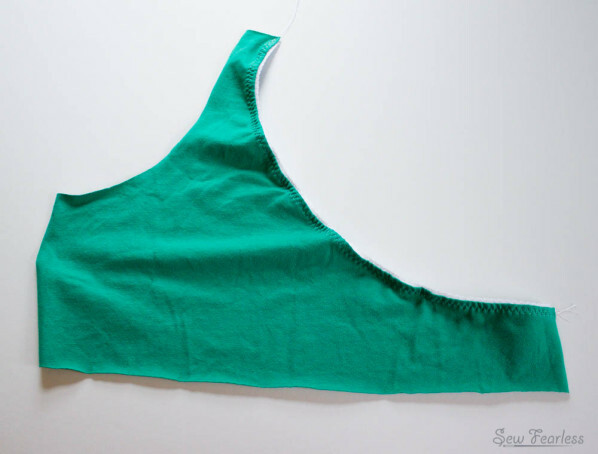 And I improved on the originals by making them out of the leftover Laguna Jersey from my maternity tank project. It makes me ridiculously happy to have such prettily-colored sleep bras. 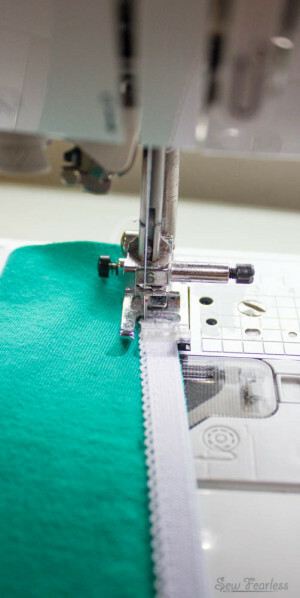 The only trick to the project is to know how to apply the lingerie elastic, which isn’t as difficult as you would think, and it can be done your standard sewing machine. After I traced a pattern from the original bra, I added hem allowances to each of these edges that equal the width of the elastic to be attached. 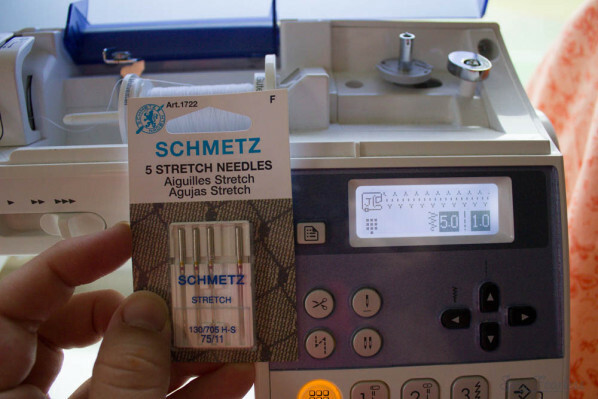 Use a “Stretch Needle” and a “3-Step Zig-Zag” stitch with a coordinating all-purpose thread. 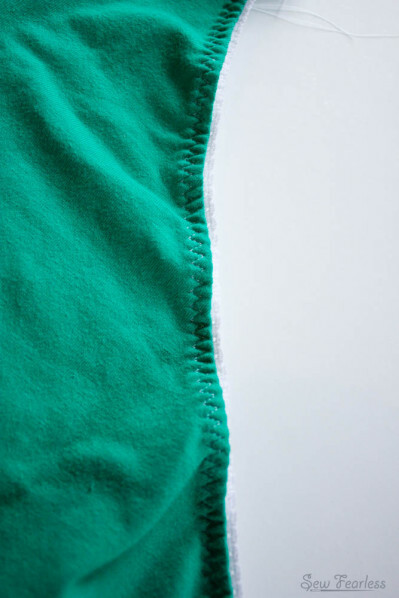 Lay the elastic on the right side of the undergarment along the edge of your garment, with the side of the elastic that will be facing your body facing up, and the decorative edge pointing away from the hem allowance. If the elastic has a decorative edge that is meant to “peek” out beyond the garment hem, use a hem allowance that is smaller than the width of the elastic. For example, the stretch lace elastic used on the neckline of this bra is 3/8 inch wide. I wanted the lace edge to peak out by 1/8 inch so I only used a 1/4 inch hem allowance along that edge. 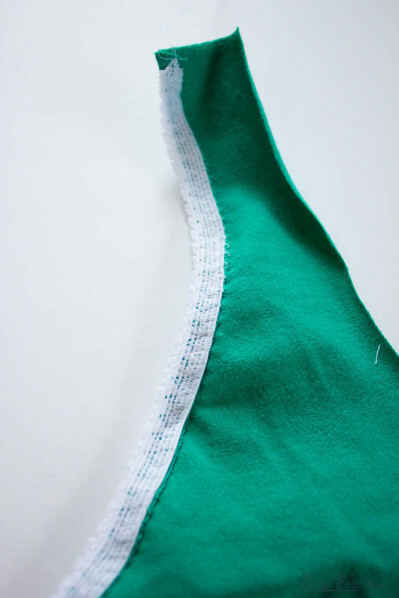 Fold the elastic to the wrong side along the garment along the hem line. 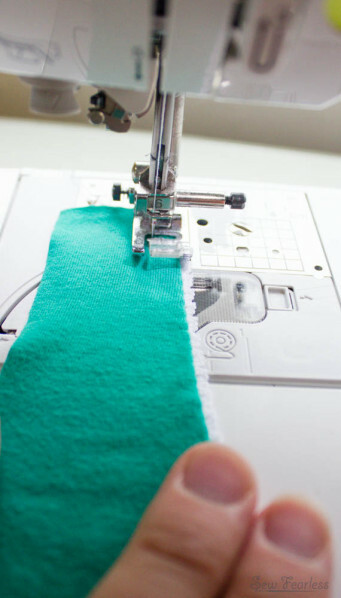 Sew along the fold with a 3-step zig-zag, stretching the elastic smooth while sewing. Again, the left-most stitch step should land the same distance from the edge as the hem allowance. 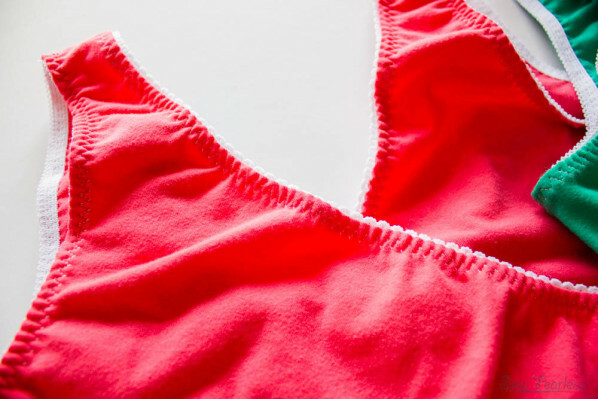 This encloses the hem allowance underneath the elastic. And the edge is finished! Easy, eh? This was such a satisfying project, I do hope I can find a good daytime nursing bra pattern soon! 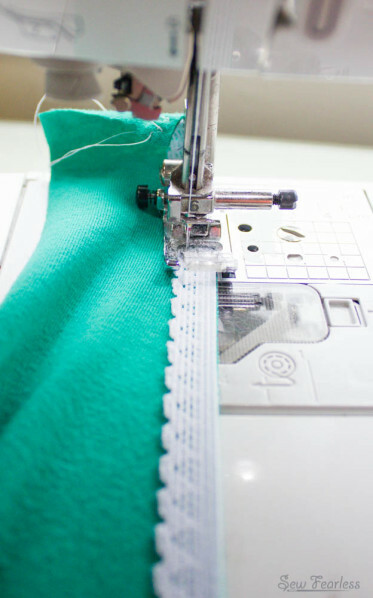 Have you tried any lingerie sewing yet? So pretty, can’t wait to try and make some. Thanks for showing us how you made them. Have you thought about drafting and selling a pattern? You know- to save the rest of us the trip to evil maternity store? I don’t know how hard that would be, but these aren’t based on cup size- right? I’ve been dabbling a bit in undergarment sewing too! I’d love to one day have every stitch on my body made by me- right on down to my shoes. These turned out beautifully! 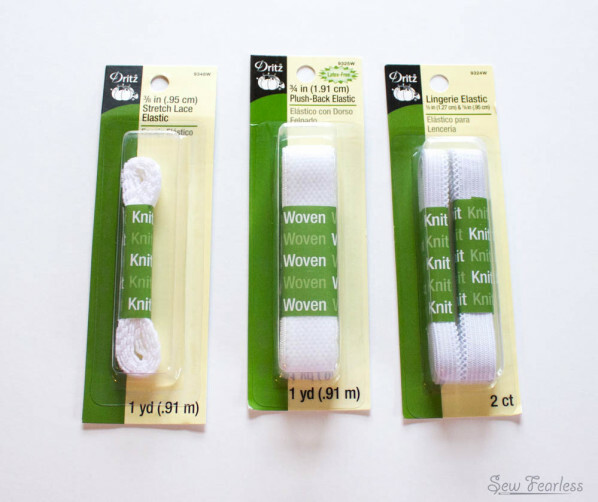 I’m curious though- why so many different elastics? I love your website however my old eyes are finding the print very hard to read. Thanks for the feedback, Vicki. I’ll look into it. Thanks for the very clear pictures and instructions. 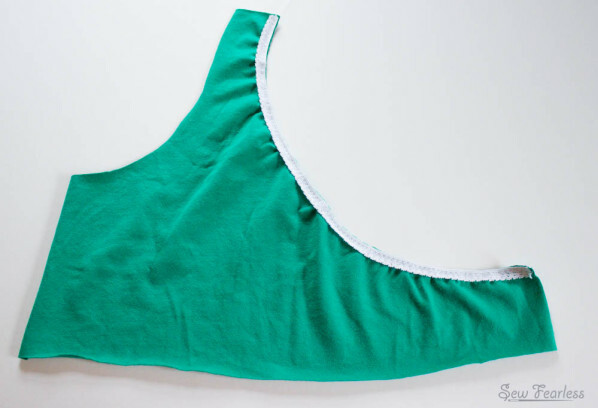 The last time i needed a nursing bra was 30 years ago…. But I have been searching for a comfortable bra pattern without underwires (which, after nursing 3 babies, are no longer necessary). So in searching for such a pattern I stumbles upon your blog. Do consider selling a pattern!